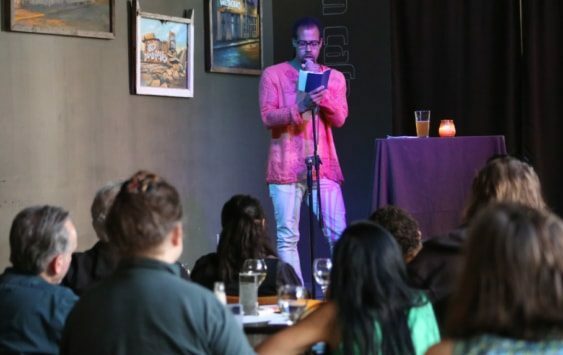 Uptown Oakland’s Beast Crawl unleashes its sixth annual free literary festival featuring more than 150 writers in a single night, spread out over three hours and nearly 40 local galleries, bars, restaurants, cafés, and storefronts. 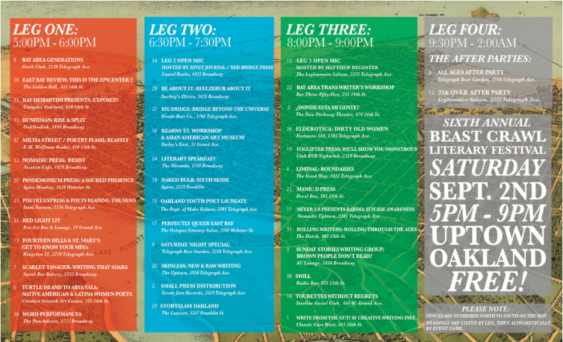 Everyone is invited to the Leg 4 After Parties (marked with stars on the crawl map) starting at 9 pm at The Legionnaire Saloon (drinks, dancing, 21+) and Telegraph Beer Garden (food, drinks, all ages). Each leg of The Beast lasts one hour, and offers a dozen different readings to chose from. There’s a half hour break between literary legs for socializing and relocating to a new venue before the next reading begins. It is recommended that you choose one reading per leg. You can even plan your route in advance. To curate these literary events for Beast Crawl, they have invited a diverse collection of local reading series producers and literary rock stars including Tourettes Without Regrets, Saturday Night Special, The Pedestrian Press, Kundiman, Be About It, Lip Service West, Pochino Press, Queer Spectrum Media, Oakland Crossroads, Mixer 2.0, and many more.